It was 92° F. in Las Vegas today. Way to hot to cook and definitely time to clean out the refrigerator. So here’s my version of a veggie sandwich that turned out so big I ate half for lunch and half for dinner. Watched cooking videos all afternoon, took a nap and twittered. Never thought a veggie thing would fill me up like that. This would make a great sandwich for a picnic. I baked an Italian rustic bread on Friday and it was perfect for this sandwich. The hummus was a snap to make in food processor with just a can of garbonzo beans, garlic, olive oil, lemon juice, hot sauce and salt. 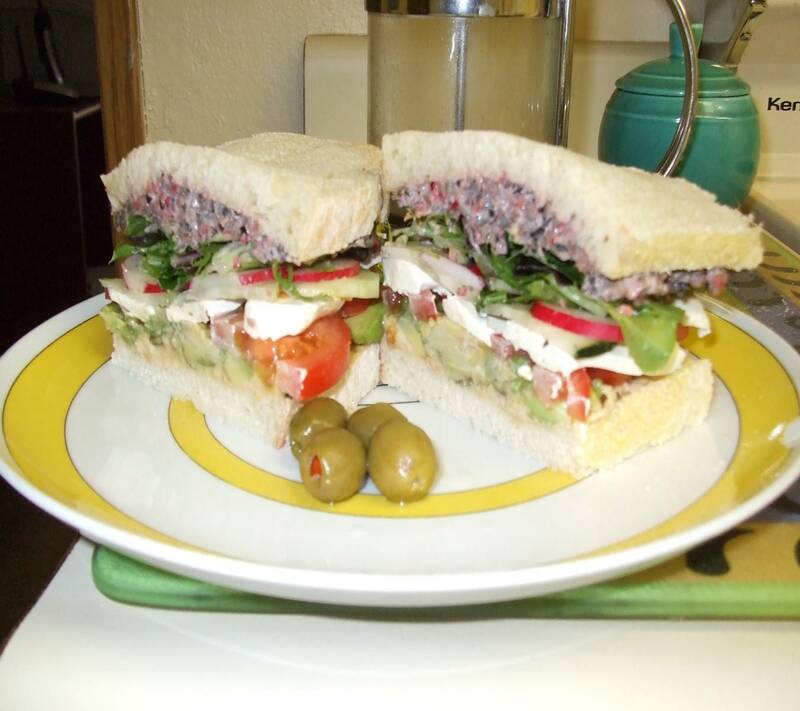 The tapenade was made with leftover Greek olives, leftover capers, leftover chopped onion, a can of anchovies, leftover dried raspberries, a dab of mayo and some parsley. Slice the goats cheese with dental floss rather than a knife. Salt and pepper the tomato, cucumber and avocado once layered on the hummus. You don’t need a lengthy shopping list to create a healthy crunchy salad for supper. This really isn’t a recipe so much as it is a list of options based on what you have on hand. That’s usually the way great dishes are developed. The idea is to balance textures and flavors while packing in lots of nutrition. And the addition of protein will satisfy the hunger pangs and stay with you longer than carbohydrates alone. It couldn’t be simpler or quicker on a warm summer evening to throw a main dish salad together. Fresh ginger and pureed Mandarin oranges in a vinaigrette gives this salad an Asian tweak. 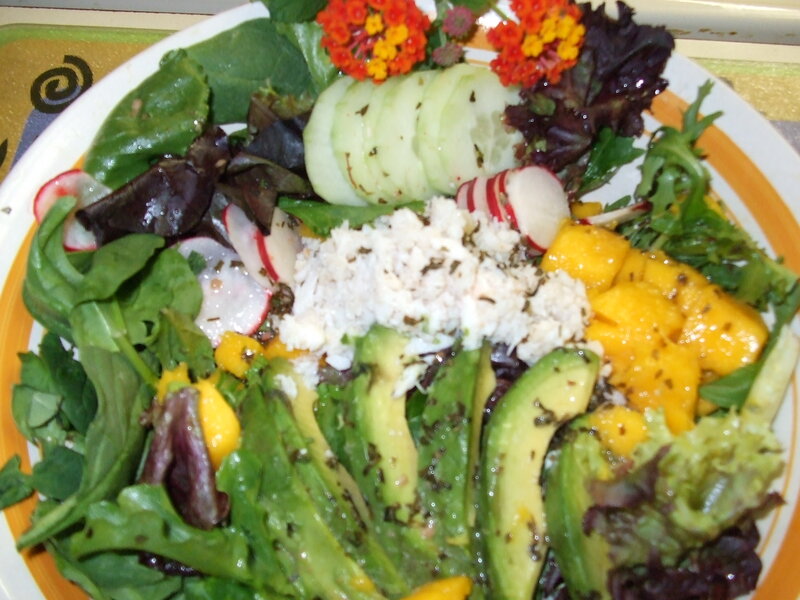 The balance of nutrition from protein rich lump crab and vitamin rich mango and avocado makes this a dieter’s delight. Some crunchy radishes and cucumbers are added to round out the textures and flavors. Serve it with a tomato zucchini gazpacho and a crusty baguette. Carry the Asian theme further with a mango lime sorbet for dessert. For more crunch add mung bean sprouts and fresh snow peas. Substitute asparagus for the avocado. Use julienned daikon radish instead of red radishes. Julienned carrots and cabbage may be added and chopped romaine lettuce may be used instead of mixed baby greens. Substitute tuna packed in water, poached salmon, or leftover baked tilapia for the lump crab or use a can of baby shrimp. 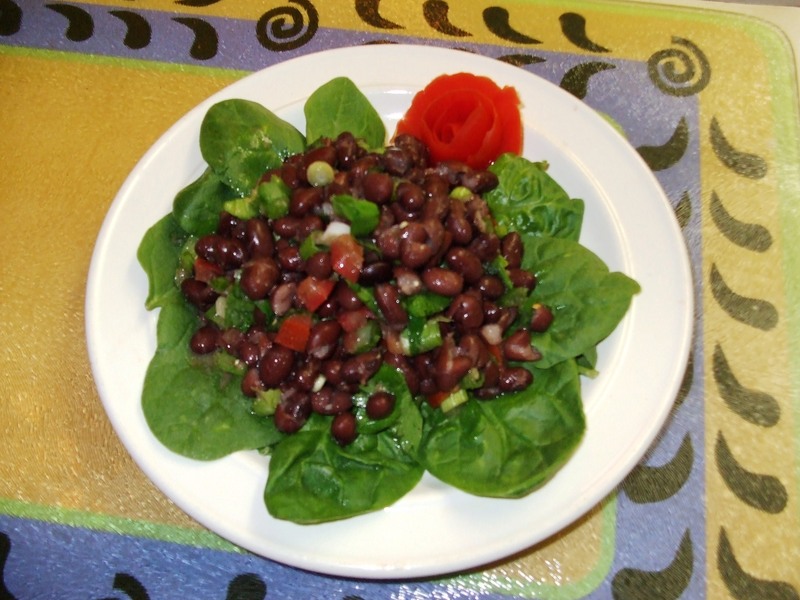 For a vegan version use a can of black beans or cannelini beans in place of the fish and add sweet corn or corn tortilla strips to make a perfect protein. Canned or fresh peaches will also work in place of the ripe mango and a few slices of pureed peach will definitely add a new flavor dimension to the vinaigrette. Arrange fruit and vegetables on top of greens. Cover and chill. Place mandarin oranges, oil, lemon juice, chili sauce, ginger, parsley, salt and pepper in a blender and puree until smooth. Spoon dressing over salad and toss just before serving. This recipe is from the late 1960’s when I was a newly wed and living in Spokane, Washington. It started out as a potato salad with pasta instead of potatoes, a mayonnaise dressing with mustard and dill pickles, a can of tuna, onions and radishes. Even in those days no one complained and there was never any leftovers. That was quite a compliment considering some of my cooking disasters. I loved to bake and can fruit but hadn’t had a lot of experience cooking dinners way back then. Over the years, this dish has taken on new dimensions as I’ve added more veggies, olives, roasted red peppers, even artichoke hearts and switched to a vinaigrette instead of the calorie laden mayonnaise. This main dish salad can be made with shrimp, lump crab, poached salmon, roasted chicken or even ham. Any size pasta shells will do or try it with your favorite type of pasta. Just a cup and a half of pasta will make 4 ample servings, very economical, and quick to prepare. Prep all the veggies and whip up the vinaigrette while the pasta and eggs cook. The pasta will absorb less oil if rinsed in cold water before assembling salad. Bring 6 cups of water to a boil, add 1 tsp salt, pasta shells and eggs. Cook for 7 minutes until pasta is al dente. Drain pasta and rinse in cold water. Run cold water over eggs and shell while holding eggs under water. Place pasta, eggs, diced veggies and olives in a large bowl. In a small bowl, pour lemon juice, olive oil, herbs, garlic salt, pepper and Tabasco sauce. Whisk until well incorporated. You may use a jar with a screw lid and shake vinaigrette vigorously. Pour over salad and toss. Check seasoning and adjust if necessary. 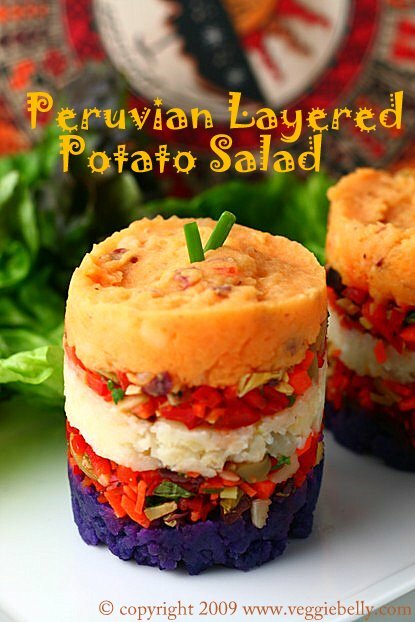 I found this stunning Peruvian causa recipe on veggiebellie.com and thought this would be a perfect salad, with a couple tweaks, for Memorial Day. 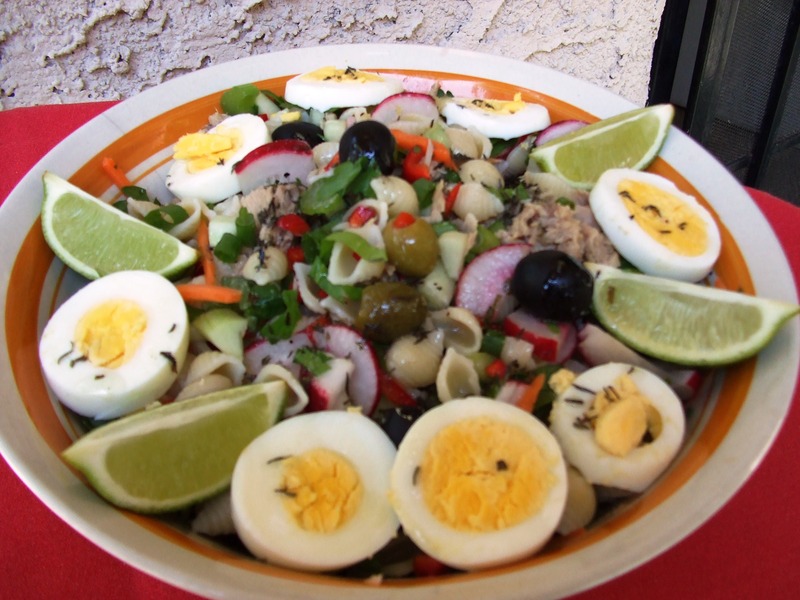 The colors are so vibrant and the taste is sensational with lots of lime and garlic in the potatoes, and a red pepper and celery salad with green olives. A causa is anything layered with mashed potatoes. So this will not be a causa, strickly speaking, as I’m going to do the layers in a trifle bowl of clear glass with sliced purple and white potatoes instead of mashed potatoes, top it with a layer of roasted red pepper salad and dress it with a Spanish sherry vinegar and avocado oil vinaigrette. Purple and blue potatoes are the latest trend in designer veggies but they’ve been around for decades in Peru and Chile. 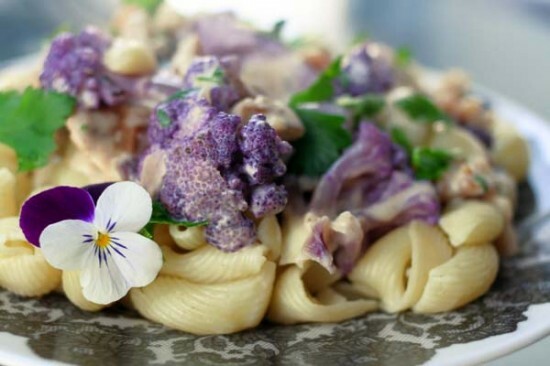 Jamie Oliver’s recipe for purple potato salad incorporates sour cream or creme fraiche but it muddles the colors of the potatoes and radishes, though its very tasty and comforting. Another lovely veggie is the purple cauliflower (Cafe Liz photo) and it too makes a fabulous salad with fresh asparagus, yellow summer squash, red peppers, ripe olives, fresh dill and a Spanish sherry vinegar vinaigrette. Photo from Sunset. Grilled country style ribs, corn on the cob, and strawberry shortcake will complete the menu. Be sure to take flowers to the cemetary on this national day of remembrance. Whisk together oil, lime juice, garlic, cracked pepper and salt. 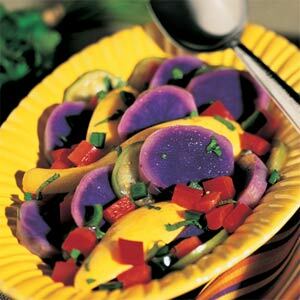 Toss purple potatoes with half the oil mixture. Layer into bottom of the glass bowl. Toss new potatoes with remaining oil mixture. Layer on top of purple potatoes. Combine remaining ingredients in a bowl. Spoon on top of white potatoes. In 1979 I attended an IBM Systems Operator Certification program in Tempe, AZ. At that time reel-to-reel magnetic tape was still being used in systems and cobal was the programming language of choice. My most memorable experience, besides graduation ceremonies and floating the Mesa River in inner-tubes, was a romantic dinner at an Italian restaurant in Phoenix. The restaurant was elegant with white linens and silver cutlery, the service was attentive, and the starter dish, Octopus salad, was to die for. From the first bite, I was in love. It was not rubbery, nor fishy tasting, but lemony and salty with capers, creamy with olive oil and crunchy with celery. I moved to Alaska shortly thereafter, where octopus is fresh caught, blanched to a coral color, and the tenacles are as big as tennis racket handles. In fact, whole octopi are so large in the Aleutian Islands that one tenacle was enough for 6 servings of this starter dish. The easiest way to the strip the skin off the tenacles was with a boning knife. Once the tenacles were stripped and diced, it was easy to marinate and throw together on a bed of lettuce, garnish with parsley and serve with a crostini. You can leave the skin on if you prefer, I don’t, unless the octopus is very skinny as they are in the South Pacific. Then I prefer them really well cooked, until the skin turns purple, and simmered in coconut milk. That’s the Polynesian method and it is very tasty also. Whatever octopi you use for this dish, pulpos from Mexico, or larger varieties from the Pacific Northwest, be sure to include the tips of the tenacles for extra crunch, remove the beeks and clean the heads. The ink from the heads can be used to color fresh pasta dough. Mix all ingredients except lettuce in a glass bowl. Cover and refrigerate for at least 3 hours. 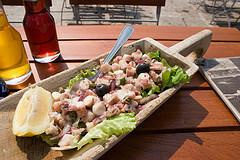 Place a mound of lettuce on each of 6 cold serving plates, top with 1/2 cup of marinated octopus. Serve with crackers or toasted crostini. Sarah E. Ludwig is a freelance writer and mom to four busy kids between the ages of 10 and 5, including a set of twins. She blogs at Parenting By Trial and Error and her philosophy is that anyone who has kids knows that parenting is all about trial and error, learning, growing and, most importantly, staying flexible. Each child is unique. What might work for one, may not for another. Nobody knows better than you, the parent, how to best handle your child, but sometimes you have to try several solutions before finding the right one. Discussions, advice and shared experiences between parents can help us find the right formula for our children’s personalities and needs, and it is with that in mind that she created a blog. I’ll admit it; I’m not much of a cook. The smattering of times I’ve stretched my culinary skills have always ended up with complaints such as, “Ewww, what is this? ?” or “Do I have to eat this?” and me angry that I wasted my time. Even though I really like trying new dishes, as a busy mom of four, I just don’t have the time to make even semi-complicated meals that nobody but me enjoys anyway. It’s not worth it. So when one of my friends introduced me to her taco salad recipe, I was intrigued. It’s easy, delicious, feeds a ton of people and has fast become a potluck and family gathering favorite. Fat- and calorie- free it’s not, but it’s rare for me to find a dish that all my kids love. This is one of the few. Cook hamburger with taco seasoning according to the package directions. Add the kidney beans and chill for at least 2 hours or overnight. Stir tomatoes, olives and cheese in with the meat. Just before serving, add lettuce, Doritos and dressing. If you add these too soon, the chips will get soggy. I never add tomatoes because I’ve found that most of the people I serve this to don’t like them. This recipe makes a huge bowl full, so unless you’re taking it to a big gathering, sharing with another family or don’t mind soggy leftovers, you’ll probably want to halve it. This dish was inspired by an old friend in Tyler, TX. She made it with just peas, cheese, onion and mayonnaise. I’ve kicked it up a bit with the addition of bacon, mint, and red onion. It is so simple to make and great for a buffet or pot-luck. The recipe is for frozen peas but if you’re not opposed to shelling your own fresh peas by all means do use fresh sweet peas from the garden or Farmers Market. 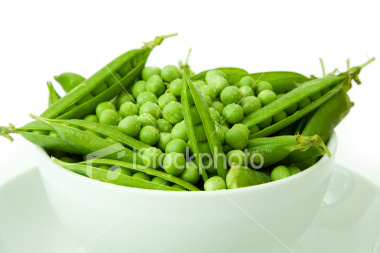 Just steam fresh peas for 5-7 minutes and plunk them in ice water to chill, then drain before assembling the salad. Also, to reduce fat and calories you may dress the salad with a mint vinaigrette instead of mayonnaise. Red onions are pungent so you may want to use Walla Walla sweets or another white onion variety. Try this with left over chicken or ham instead of bacon. The substitutions are endless. Drain peas thoroughly, add all other ingredients and fold together until well combined.